Compartment syndrome is a painful and potentially serious condition caused by bleeding or swelling within an enclosed bundle of muscles – known as a muscle compartment. Each group of muscles in the arms and legs, together with nearby blood vessels and nerves, is contained in a space surrounded by tissue called fascia. 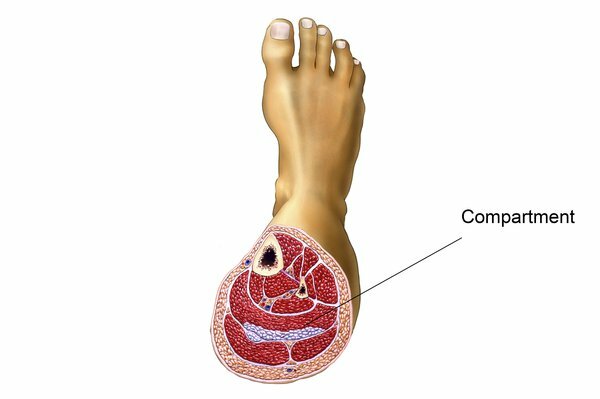 Compartment syndrome occurs when the pressure within a compartment increases, restricting the blood flow to the area and potentially damaging the muscles and nearby nerves. It usually occurs in the legs, feet, arms or hands, but can occur wherever there's an enclosed compartment inside the body. There are 2 main types of compartment syndrome: acute compartment syndrome and chronic (also called exertional) compartment syndrome. Symptoms of acute compartment syndrome usually develop after an injury and get quickly worse. Symptoms of chronic compartment syndrome tend to develop gradually during exercise and improve with rest. go to your nearest accident and emergency (A&E) department as soon as possible if you think you have acute compartment syndrome. Acute compartment syndrome is a medical emergency and ideally needs to be treated in hospital within a few hours to avoid permanent damage to the muscles or nerves. Chronic compartment syndrome is much less serious, but it's a good idea to get your symptoms checked out and have the cause diagnosed. In rare cases, it can occur without any obvious injury. Chronic compartment syndrome usually occurs in young people who do regular repetitive exercise, such as running or cycling. One theory is that it's caused by temporary swelling of the muscles during exercise affecting the blood supply to a whole group of muscles. Acute compartment syndrome must be treated in hospital using a surgical procedure called an emergency fasciotomy. The doctor or surgeon makes an incision to cut open your skin and fascia surrounding the muscles to immediately relieve the pressure inside the muscle compartment. The wound will usually be closed a few days later. Occasionally, a skin graft may be required to cover the wound. Chronic compartment syndrome isn't usually dangerous, and can sometimes be relieved by stopping the exercise that triggers it and switching to a less strenuous activity. Physiotherapy, shoe inserts (orthotics) and non-steroidal anti-inflammatory medicines may help – speak to your GP about this. Surgery will only be considered if your symptoms persist despite the above measures. In these cases, you'll go on a waiting list, as chronic compartment syndrome isn't a medical emergency.